People who copy a work that is protected under copyright without permission can be punished by the law, usually with a fine. In other, more serious cases, a person who copies a work that is protected under copyright could be arrested and go to prison. In most countries, there is no need to register the copyright, and some countries do not even have procedures to register copyrights. But, in countries where registration is available, without registration, it may be difficult to prove that the copyright of a work belongs to a certain author. So it is often a good idea to register anyway, especially for works that are sold for money. If an author gets paid to make a work for someone else, the person who pays for making the work (for example, the author's employer) will often get to own the copyright instead of the author him- or herself. 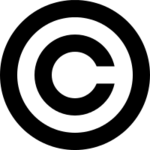 For example if a person working for a company like Microsoft creates a new computer software program at work, the Microsoft company would own the copyright. Copyright laws usually protect the owner of copyright for their entire lifetime, such as until 50 years after the author's death. This period has now been extended to 70 years in most cases. When the period of copyright protection has ended, the written document, musical composition, book, picture, or other creative work is in the public domain. This means that no one owns the copyright to them, and everyone is free to copy, use and change them without having to ask for permission or pay the owner. ↑ Publication Right, Database Right. This page was last edited on 26 October 2018, at 03:05.